Patrician Blinds Production Time: 3 business days! Looking for our Wood Blinds? Question: What is the difference between wood and faux wood blinds? 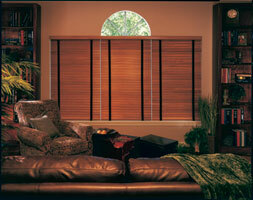 Faux wood blinds have only recently become more widely available and popular due mainly to their cost advantage. They look much like real wood and are more resistant to moisture, scratches, and breakage. However, wood insulates better and gives a room a warm feel. Look of real wood with all the practicality of polyvinyl material. All blinds and shades will have the pull cords on the right side as a standard feature unless otherwise specified. You may specify pull cords on the left on the order form. There is no extra cost to make this change. It is U.V. treated to protect against the yellowing effects of sun exposure. It is flame-retardant and resists affects of exposure to humidity and external temperatures. This makes it ideal for your utility, kitchen, and bathrooms, etc. They are easy to clean with soap and water. Scratches are almost invisible as the color goes throughout the material; it is not applied just to the surface. Our Premium Fauxwood Blinds are made from a blend of PVC and American hardwood. Our Quality Fauxwood Blinds are made 100% from PVC and are certified as flame retardant. Valances, bottomrails, cord tassels and bottomrail plugs are color coordinated to the slat finish. The steel headrails are also color coordinated to the slats. All mounting hardware is included: hold downs, spacer blocks and extension brackets when specified. You may need to purchase screws size #6 x 1-5/8 sheet rock-style screws or #6 x 1" wood screws. Six screws per blind are the average number required. Warranty: 1-year against manufacturer�s defects. Minimum width: 21" Maximum width:72.00"
Our most popular blind because it is high in quality and lower in cost. They can be delivered faster,too. 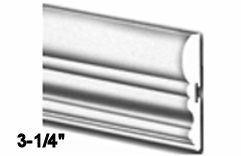 If ordering INSIDE MOUNT, give us YOUR EXACT WINDOW size to the nearest 1/8"
If ordering OUTSIDE MOUNT, give us YOUR EXACT BLIND/SHADE size needed. The Majestic valance is now available with 1-1/2 inch returns for an outside mount valance to fit over inside mount blinds. The measurement for the returns is from the front of the valance to the back of the return. There is no charge for this option; however, you must request it. We also will need to know if your windows have rounded corners (bull nose) or square corners. Blinds over 72" wide must be made as a two blinds (add 15%) or three blinds (add 20%) on one headrail. Blinds with headrails over 84" will be subject to an additional freight charge of $85 for the first oversized blind per order and $50 for each additional oversized blind. Blinds over 72" must be made as a two or three blinds on one headrail to qualify for warranty. If you would like to order your blinds as 2 on 1 headrail or 3 on 1 headrail, please click here. Is the total WIDTH of this blind headrail OVER 84"? Yes - Add $85.00 for 1st oversized blinds box charge. Yes - Add $50.00 for each additional oversized blinds box charge. Includes a 3.25" Sculpted Valance and a trapezoid bottomrail. Cord tilter available with a net width of 10.5" or more. Available in 7 stain-look colors! Wand: Color coordinated to match slats. PVC wands on white colors up to 60"
Wood wands up to 48"
Clear lucite available upon request in 54" and 72". Inside Mount Valance: 3" face x .375" greater than headrail. Outside Mount Valance 3.25" face 1.5" greater than headrail, mitre-cut and 3.125" return. Blinds over 60" wide must be made as a two blinds (add 15%) or three blinds (add 20%) on one headrail. Slats, valance, bottom rail, cord tassels and plugs are color coordinated to match with finished ends. These flame-retardant blinds are probably the most beautiful faux wood blinds you can own. The finish on these blinds incorporates the color variations and appearance of grain found in real wood. These brilliant wood-grain colors are the new generation of faux. They are so perfect you will not believe they are faux. The beautiful wood-grain colors coordinate with the 3-1/4� sculpted valances, trapezoid bottomrails, tassels and cords. Cloth tapes are also available in 36 colors/designs as is a motorized tilt option. Production Time: 3 business days! Call (866) 5-BUY-ACE to order! Outside Mount Valance 3" face 2" greater than headrail, mitre-cut and 3.5" return. Blinds over 60" wide and longer than 54" must be made as a two blinds (add 15%) or three blinds (add 20%) on one headrail. View ALL 30 Faux Wood Blinds Colors Available!! Slats, valance, bottom rail, cord tassels and plugs are color coordinated to match.